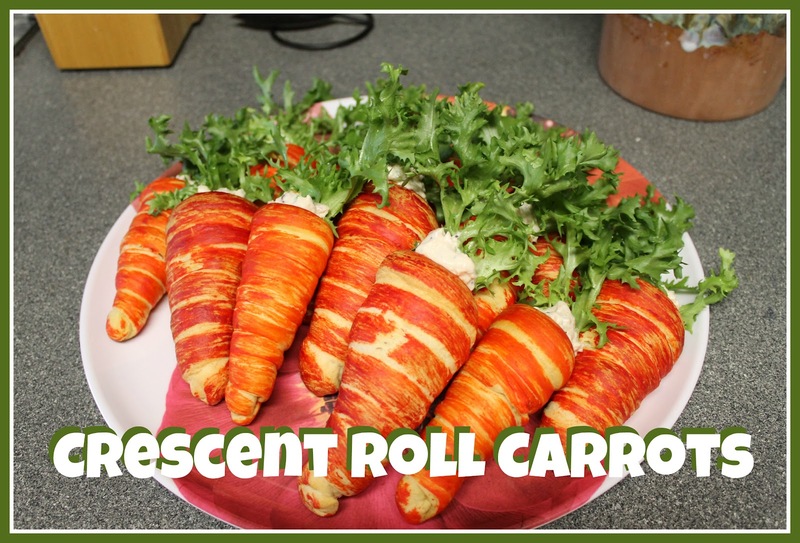 Living My Life On Purpose: Crescent Carrots! Ok, first spread your dough out and pinch all of the seams together. Then, wrap each snake around your cream horn cones. Make sure there is cone sticking out of the top or else it might make removing them a little difficult. Next, mix up a little orange food coloring (red and yellow make orange... in case you failed art) and paint it on the rolls with a basting brush. I added a couple of drops of water to thin it out a bit. Bake according to the directions on the crescent tube. Remove the tiny party hats to reveal a perfect cone that just screams, "stuff me!" For the stuffing, I used chicken salad that I bought from my deli. You could use anything really. I wanted to make egg salad to stuff in it (as a ways to use up Easter eggs), but sadly, I do not know how to make it. Put your sandwich spread in a plastic baggie. Snip the corner off of the bag. Finally, stick a leaf of lettuce in the top! I like the endive lettuce because it looks more like a carrot top. There you have it! Cutsie little Easter sandwiches! BlogHer is featuring this post on Wednesday, April 4th in the What's Hot column on their Food landing page! I'm linking these up to my favorite linky parties AND adding them to the book... Did you know I'm writing a book? Well, a collaboration with my bestie from the westie :o) Due out sometime in the next 50 years or so... Anyway, ENJOY! Oh my gosh! That is so cool. What a great addition to Easter Brunch! Very clever and yummy-looking! wow! pretty clever!!! This book, I have the first draft? And I can get a printed copy of this to add to my book? These look so fun! I really want to try this for Easter. Thanks for sharing! Hi Shannon! These are just too stinkin' cute! I love how much they really look like a carrot. I'm also a little bit jealous that you went to a Pinterest party. LOL All of my friends who are on Pinterest, live in other cities. (sigh) Stopping by and following from It's A Keeper Thursday. Thanks for sharing this really cute idea! So, so cute! I absolutely love this idea! These look so cool and tasty! I would love it if you shared them at my Easter Inspiration Party! Found you on the It's a Keeper Linky Party! This is such a fun idea! And I bet they're delicious! Thanks for linking up for Friday Favorites! I'm featuring you this week! Thant is awesome!! Whoever originally came up with it is a genius! Thank you for sharing! "(red and yellow make orange... in case you failed art)" -- you're a jerk.